Students, faculty and community members gathered in Weaver Chapel Friday to celebrate Candlemas. Candlemas celebrates one of the oldest festivals in the Epiphany Season— the meeting of ancient Simeon and baby Jesus. The Candlemas service attempts to reflect medieval traditions through music, vestments and symbols. “It [Candlemas] benefits Wittenberg because it offers music that most people haven’t heard, gives people a medieval idea of how it was celebrated in the past… [and] it’s a history lesson too,” Reverend Andy Tune said. This service celebrates the medieval customs of what church was like years ago. The service is usually done on the exact day of the celebration, which was Feb. 2, but Reverand Tune thought Friday would be more convenient for people. The service began with a procession down the aisle where the ushers lit candles that each person held. 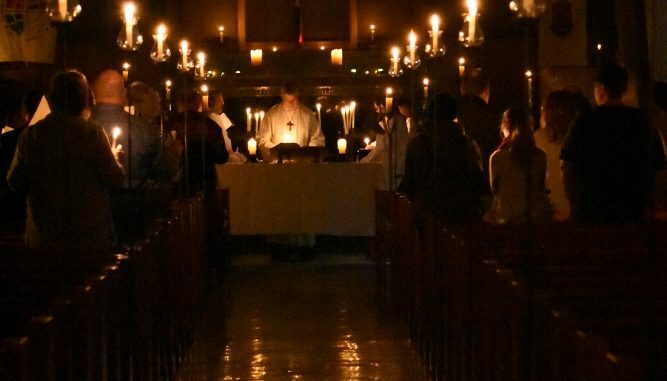 The light was then passed on to others in the chapel, similar to the candles in Lessons and Carols; however, during Candlemas, the candles burned until the end of the service. This service differs from other services in the chapel because there is no PA system, no offering. There is acapella singing and there are candles throughout the chapel with each person, said Reverend Tune. The music for the service is medieval or earlier with the exception of some Renaissance music. Wind in the Woods, an instrumentalist group, played music at the service. The group is made up of Jenelle Allen, Margaret Erin, Michael Mattemore and Lawrence Pitzer. The Chapel Choir also sang; they are made up of David Weimer, the interim director and organist, Sam Bennett, ’22; Angelique Gabrielle, ’17; Grant Steele, ’20; Deanna Torstenson, ’19, and Audrey Przyzycki, ’22. Katie Robinson, ‘20, said she liked the music, candles and Gregorian chants in the service. Reverend Tune sang two of the readings from the service; he said people used singing years ago to project their voice. Christians have used candles for services for centuries and by filling the chapel with them it reiterates the idea of simple services back in time, Reverend Tune said. The service was relaxing and calming, commented Laura Stauffer, ’22. She also liked how the service made her feel like she was walking back in time. Megan Mong, ’19, and Olivia Riddle, ’20, were ushers for the service.